A 21 year old woman presenting with galactorrhoea, hyperprolactinaemia, and a pituitary mass on magnetic resonance imaging (MRI) is described who was referred to us before planned pituitary surgery. Although a thorough history did not suggest hypothyroidism, laboratory studies revealed profound primary hypothyroidism. At that time, pituitary MRI showed homogeneous enlargement of the pituitary gland consistent with pituitary hyperplasia due to primary hypothyroidism. With thyroid hormone replacement therapy the galactorrhoea resolved, concentrations of prolactin and thyroid hormones returned to normal, and the pituitary shrunk to normal size within two months. This case illustrates that primary hypothyroidism can present only with galactorrhoea and pituitary mass, and should therefore be considered in the differential diagnosis of hyperprolactinaemia and pituitary enlargement. Galactorrhoea is a common symptom of hyperprolactinaemia in premenopausal women. The most frequent causes of pathological hyperprolactinaemia are pituitary tumours and drugs with dopamine antagonist properties, whereas less common aetiologies include hypothalamic disease, chronic renal failure, liver cirrhosis, breast disease, chest wall trauma, spinal cord lesion, and primary hypothyroidism. However, in patients with primary hypothyroidism galactorrhoea is a rare feature compared with the typical symptoms such as fatigue, weight gain, cold intolerance, constipation, dry skin, and myopathy. We describe a patient initially presenting with galactorrhoea and pituitary enlargement, but without any other characteristic symptoms suggesting primary hypothyroidism. A 21 year old woman (born in 1977) had a two year history of increasing galactorrhoea. Six months earlier, she had started a hormonal contraception with a triphasic combination of oestrogens (ethinyloestradiol) and progestins (gestodene). In the past, her menstrual cycle had been normal and regular, since menarche at the age of 13 (in 1990). In October 1997 mild hyperprolactinaemia (prolactin 37.7 μg/l) was found and magnetic resonance imaging (MRI) revealed a 8 mm sized pituitary tumour. In January 1998, she was admitted to our outpatient endocrinology division for preoperative evaluation of the pituitary tumour and galactorrhoea. She complained of galactorrhoea cyclically increasing before menstrual bleeding. She did not suffer any other symptoms nor take any medication except for the oral contraceptive. She went to a teacher training college and was fit. Physical examination revealed a healthy appearing woman of normal weight (59.5 kg) and height (169 cm) with a regular heart rate of 64 beats/min, a blood pressure of 132/88 mm Hg, normal voice, skin, hair, nails, and thyroid gland. Bilateral expressible galactorrhoea was present. The ankle jerks showed a markedly delayed relaxation phase. Haematological tests revealed a low haemoglobin of 113 g/l (normal range 123–158 g/l) and packed cell volume of 0.353 (0.37–0.47). Blood chemistry showed raised concentrations of total cholesterol of 9.3 mmol/l and total creatine kinase activity of 917 U/l (<150 U/l). The endocrinological tests confirmed hyperprolactinaemia (prolactin 118 μg/l, normal range 2–20) and disclosed primary hypothyroidism with low free thyroxine (5.1 pmol/l, normal range 8.5–19.0), low free triiodothyronine (1.5 pmol/l, normal range 3.5–6.2), and markedly increased thyroid stimulating hormone (TSH) (506.75 mU/l, normal range 0.1–4.0). Thyroglobulin and thyroid peroxidase antibodies were raised, suggesting autoimmune thyroid disease. Pituitary MRI performed at that time showed homogeneous enlargement of the pituitary gland (12 × 10 mm in diameter) with a convex suprasellar expansion and without any signs of a focal lesion, consistent with pituitary hyperplasia due to primary hypothyroidism (fig 1A). 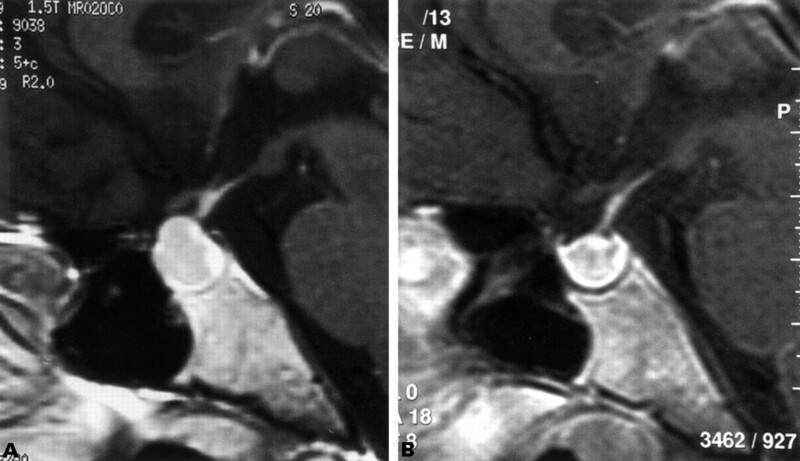 Mid-sagittal T1 weighted magnetic resonance imaging of the sellar region: (A) on 12 February 1998, showing homogeneous enlargement of the pituitary gland with convex suprasellar expansion, measuring 12 mm in height, without any signs of a focal lesion and (B) on 14 April after two months of thyroxine replacement showing significant shrinkage of the pituitary gland to normal configuration and height, 8.5 mm. The patient was advised to stop taking the oral contraceptive, and thyroxine replacement was initiated with 50 μg levothyroxine daily for two weeks and then increased to 100 μg daily. One month later the galactorrhoea resolved, and spontaneous regular menstrual bleeding returned after six weeks. In April 1998, upon two months of thyroxine substitution, free thyroxine (16.4 pmol/l), free triiodothyronine (4.4 pmol/l) and prolactin (12.7 μg/l) concentrations were normal, and TSH was only slightly raised (7.66 mU/l). On repeat MRI of the sellar region, the volume of the pituitary had shrunk to normal size (8.5 × 9 mm in diameter; fig 1B). Thyroxine replacement for primary hypothyroidism resolves galactorrhoea and amenorrhoea, causes the prolactin concentrations to return to normal, and results in rapid regression of pituitary size (fig1B).5 8 10 Thus, it is important to check thyroid function in all patients with hyperprolactinaemia as well as in patients with pituitary enlargement before the diagnosis of prolactinoma is made. Other secondary causes of hyperprolactinaemia should also be excluded. Profound biochemical hypothyroidism may exist in apparently healthy individuals with minimal clinical evidence of hypothyroidism. Not every patient with galactorrhoea, hyperprolactinaemia, and a pituitary mass has a prolactinoma. Hypothyroidism should always be considered in the differential diagnosis of hyperprolactinaemia and in the differential diagnosis of pituitary enlargement. (1971) Amenorrhoea, galactorrhoea, and primary hypothyroidism with high circulating levels of prolactin. BMJ iii:462–464. (1986) Amenorrhea-galactorrhea due to occult hypothyroidism. South Med J 79:183–184. (1978) Serum prolactin levels in untreated primary hypothyroidism. Am J Med 64:782–787. (1992) Pathologic hyperprolactinemia. Endocrinol Metab Clin North Am 21:877–901. (1985) Hyperprolactinemia and contraception: a prospective study. Obstet Gynecol 65:506–510. (1969) Amenorrhoea and galactorrhoea associated with hypothyroidism. Lancet ii:1399–1400. (1996) MRI of pituitary hyperplasia in hypothyroidism. Neuroradiology 38:50–52. (1984) Pituitary thyrotroph hyperplasia mimicking prolactin-secreting adenoma. J Endocrinol Invest 7:399–404. (1997) MRI-demonstrable regression of a pituitary mass in a case of primary hypothyroidism after a week of acute thyroid hormone therapy. J Clin Endocrinol Metab 82:808–811.